Knock Down the House is an apt title for the documentary by Rachel Lears, which follows the campaigns of four insurgent candidates as they try to pull upset primary victories against Democratic incumbents ahead of the 2018 mid-term elections. The four women are part, as we are appraised at the beginning of the film, of a nationwide grassroots movement sparked in opposition to Donald Trump’s election, which aims to wrest control of the House of Representatives from Republicans but also to reshape the Democratic establishment with an infusion of young, independent-minded citizen-candidates. Out of the many that would end up building the blue wave that did indeed wash over the House last November, Lears picked four women as they mounted challenges which appear to be against all odds. In West Virginia, her camera follows Paula Jean Swearengin, a coal miner’s daughter fighting the Big Energy concerns which threaten her hardscrabble community with fracking operations. In Las Vegas, we meet Amy Vilela a single mother and grandmother fighting for health care (her 21-year-old daughter died after having been refused treatment because she was uninsured). Cory Bush is a resident of the majority African American district where Michael Brown was shot and killed by police sparking the Ferguson riots. In New York’s upper boroughs, a twenty-nine-year-old Latina bartender – Alexandria Ocasio Cortez – decides to take on the entrenched political machine of Rep Joe Crowley, a high-ranking member of the Democratic hierarchy in Washington. All are political outsiders that are moved by outrage and the desire to give regular citizens a political voice and although Ocasio Cortez, by far the most recognizable of the group, understandably ends up getting the bulk of the attention but each woman’s story has an irresistible underdog appeal – it is almost impossible not to root for their uphill – and thoroughly righteous– struggle to overcome overwhelming odds. The film alternates the mundane work of political organizing: gumshoeing through neighborhoods, knocking on doors, huddling with advisers and strategists around kitchen tables – with intimate moments in which the candidates, sometimes startlingly candid, speak of their motivations and insecurities, all as the clock inexorably ticks towards election night. 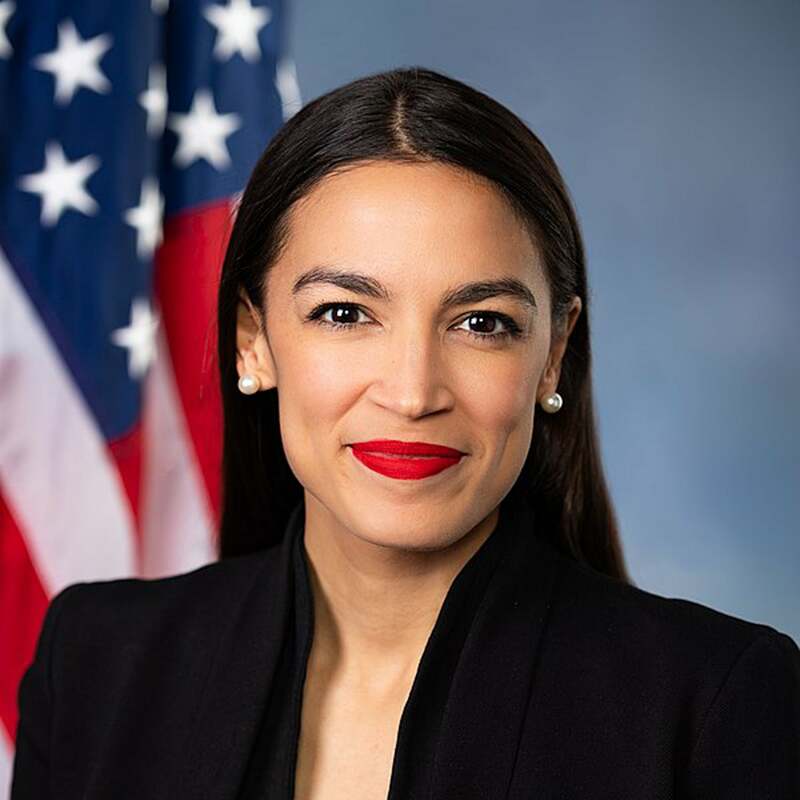 Cortez, or AOC as she has come to be known to her legion of supporters (and Instagram followers), undeniably has the starring role. Young and striking, in turn self assured and insecure, this daughter of a working-class Puerto Rican family from the Bronx stalks subway stations and neighborhood markets, glad-handing Muslim mothers, Yemeni merchants and Caribbean grandmothers with the same infectious enthusiasm and perseverance, even as she confides her doubts and fear to her boyfriend in their tiny Bronx apartment. It’s a primer on local politics as well as an inspirational road map to grassroots activism as well as a paean to Frank Capra-esque idealism. The film’s undeniable merit is to deliver a comprehensive portrait of the 29-year-old politician who has become a social media superstar and one of the most recognized faces in the political mediasphere, even while juggling multiple storylines within the confines of a snappy 90-minute running time. Knock Down the House shows the advantage of the documentary form over social media exposure which can reach wide but seldom deep. Lears spends time with Ocasio’s family and friends and the image that emerges from those encounters as well as from the family pictures and home movies is that of a woman of uncommon charisma and purpose since childhood and of an empathetic intelligence shaped largely by the tight bond with an eminently ethical father. The film’s parallel strands all converge towards the thrilling climax while offering an enlightening peek behind the political scenes. It may not feature the larger than life figures of films like The War Room (on the first Bill Clinton campaign) but Knock Down the House feels compellingly of the moment as it manages to capture the emotion of righteous political commitment. As Artistic Director John Cooper pointed out at the outset of the festival, this Sundance is the first to feature films written, conceived and shot during the Trump era and the energy and urgency of that fact are palpable in this film.